There are six key requirements for successfully implementing Customer Feedback or Net Promoter that you need to keep in mind as you launch the process. Firstly you must have buy-in from senior management. Getting a Net Promoter program up and running takes cultural change across the organisation. It also takes internal (staff) resources, budget and the commitment to follow through on delivery. If you do not have support from senior management (up to and including the business manager or CEO) then you will struggle to succeed beyond adding a question or two to your customer survey. If they are not already on-board you will probably need some business value based case studies to show what is possible. Lots of links between NPS and business value have been made but the case studies can be difficult to find. However, we have collected a range of real world statistics from different industries for just this purpose. So if you need ammunition check out this post of Net Promoter Case Studies and Success Stories. It is not always clear but Net Promoter is a new business process that needs to be integrated into the business not a new KPI. With all of the focus on the “One question” companies can think if they just put this question into their surveys they will improve their business. This is not correct. You need to build NPS focused organisational systems and continuous improvement processes to be successful. As a corollary to this: NPS is not a project. It does not have start, middle and end. It has only a start. Net Promoter is an approach to collecting and using customer feedback in the business that changes forever the way that customer understanding is incorporated into the business. You are not adding a new KPI to the company’s Balanced Score Card, you are changing how you collect and use customer feedback. After your first few months of investment in Net Promoter you are going to want to make a change to some area of the business. That change is probably going to cost money and resources. If you have not created an explicit link between NPS and some element of company value your project is not going to get off the ground. So, sooner rather than later you will need to perform some statistical analysis between your NPS measurements and a relevant business driver for your company. That driver could be retention rate, cross-sell, up-sell, acquisition rate, etc. This analysis is not difficult but you must do it to be successful. Most of our customers have done this investigation so there’s no reason you can’t as well. The famous management guru Peter Drucker is credited with saying: “What gets measured gets managed”. So it is with Net Promoter, however, you must take care when and how you set targets. Longer term (6-12 months after commencement) you should start to set targets across the organisation for improvement in the NPS. However, the biggest mistake that most organisations make is setting targets too early, before they have a good sense of what the score will be. In our experience “X points” is almost always too high. The chances of achieving that goal are low. If you want to feel good about hitting targets and moving forward wait until you have a good feel for the data before setting a target. But, when you are ready, you need to roll out goals across the organisation. Everywhere you have profit or cost as a goal you should also have Net Promoter as a goal. Remember that NPS is a predictor of revenue so today’s NPS is tomorrow’s revenue. 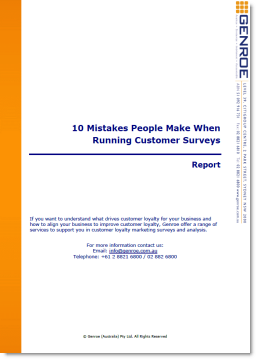 It’s tempting to make Net Promoter one person or groups responsibility. While you do need someone, or a small group, to drive the change management portion, it is a mistake to make NPS the job of Strategy or Marketing or Customer Service. This will limit your long term success. It is the organisation’s job to improve the customer experience and NPS. By broadening the responsibility to all staff you avoid the situation where everyone thinks NPS is someone else’s problem. Drive the ownership companywide and you will be more successful. In business, everything costs time and/or money to achieve. Rolling out Net Promoter is no different. If you want to succeed you will need to apply some level of budget both in terms of incremental investment and additional staff hours. Longer term, by using the Net Promoter process, you will reap rewards in terms of lower costs and greater staff efficiency but you have to invest first to obtain those benefits. Make sure that you don’t short change yourself into failure. Set aside a reasonable budget and make a commitment to the rollout of Net Promoter and you will be successful. Try to do it on a “business as usual” basis and you will struggle to succeed.